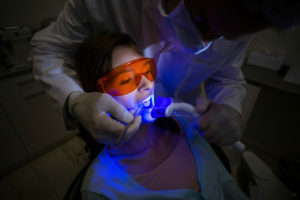 Although lasers have invaded just about all facets of our lives — everything from your rangefinder on the golf course to the scanner at the grocery store to your cat’s pointer toy — most people don’t think of them in the dentist’s office. But at Prosthodontics of New York, we pride ourselves on staying abreast of the latest technology in the dental world, from CEREC same-day crown systems to digital intraoral cameras to CAT scans for placing dental implants. Including soft-tissue lasers in our practice is just one of the latest additions. Lasers have a growing role in dental care, as they provide excellent results and reduce patient discomfort. What’s not to like about that? At Prosthodontics of New York, Dr. Roberts and Dr. Sirota are currently using soft-tissue diode lasers. We are also looking at possibly adding hard-tissue lasers in the future. Periodontal disease — We use lasers for root planing and scaling, the removal of bacteria and infected tissue from periodontal pockets, surgical reshaping of the gums to reduce the size and depth of periodontal pockets, and to promote reattachment of the gum to the tooth root. Call us at Prosthodontics of New York, (212) 758-9690, and let us put our technology to work for your oral health.